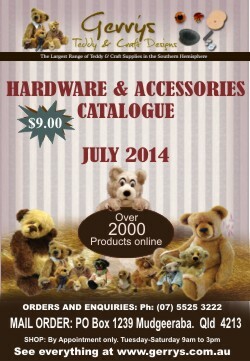 For bear makers who don't own a computer this catalogue lists all the eyes, joints, hardware, noses etc featured on our website. 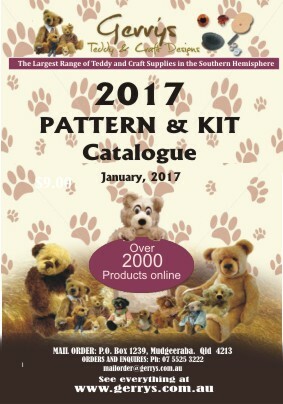 Over 150 different Bear and Critter patterns and kits to choose from ranging from 2" to 26". You are sure to find something from traditional to modern designs. Contains Samples of BAC, BACSSP, BCSSP, BDG, BSPG AND DG Mohair fabrics. Make your own Sample Book of Gerry's Schulte Mohair. Sample Cards are now available. Buy samples only of the fabrics you like to use by purchasing one of our sample sets. This contains 22 colour swatches (2 pages) so that you can see the different colours and feel the fabric. Make your own Sample Book of Gerry's Schulte Mohair. Sample Cards are now available. Buy samples only of the fabrics you like to use by purchasing one of our sample sets. PG contains 8 fabric swatches (1 page) so that you can see the different colours and feel the fabric. Make your own Sample Book of Gerry's Schulte Mohair. Sample Cards are now available. Buy samples only of the fabrics you like to use by purchasing one of our sample sets. This contains 16 fabric swatches (2 pages) so that you can see the different colours and feel the fabric. Make your own Sample Book of Gerry's Schulte Mohair. Sample Cards are now available. Buy samples only of the fabrics you like to use by purchasing one of our sample sets. This contains 20 fabric swatches (2 pages) so that you can see the different colours and feel the fabric.